Early one Sunday morning three women wove their way through the streets of Jerusalem on the way to a garden tomb. They carried with them various spices, for according to their Jewish custom, the dead body was to be anointed a few days after its burial. And this was no ordinary body. It belonged to Jesus, the prophet they had assumed was their Messiah. On their way they wondered who would roll away the giant stone that had been wedged into place to seal the tomb entrance. They surely would not have the strength to move it themselves. And the Roman unit of soldiers assigned to guard the tomb would be less than accommodating to a request to open the tomb. The stone had been rolled away. The Roman soldiers were not guarding the tomb. Jesus’ body was missing from inside. Two angels – whose countenance appeared to shine as lightning – were nearby. According to the Bible, the angels were responsible for opening the tomb (Matt. 28:2). They actually spoke to the women and told them not to fear. Jesus, whom they sought, had risen from the dead! The angels instructed the women to return and share the news with Jesus’ disciples, which they immediately did. While the women were hurriedly tracking down the disciples, the Roman guards were wandering back into the city. They had quite a story to tell the chief priests who had hired them to guard the tomb. To those who heard the tale, the soldiers must have seemed like madmen as they detailed the earthquake that shook the ground and the two men in white who descended from the clouds. Upon hearing this, the soldiers took the money and did as they were told. So the myth spread that Jesus’ body had been stolen from the tomb by his disciples…that Jesus did not physically rise from the dead. This myth had staying power too. Some 30-ish years later when the Gospel of Matthew was actually penned, the writer tells us the myth was still commonly reported among the Jews of the day. Why Would They Cover This Up? Initially, it doesn’t make sense why the religious leaders would cover this up. Wouldn’t they be pleased that a spiritual teacher like Jesus was alive again? It would seem so until you remember that the Jewish religious leaders had hated Jesus during his life. His message of hope contradicted what they erroneously taught the people. To them Jesus was a radical who threatened their positions of religious power. If the people followed Jesus’ teachings what reason would exist for the religious leaders to have a position of authority? The answer is there would be none. And the fact the religious leaders didn’t launch an investigation to find and retrieve the body implies they too thought Jesus had actually risen. Maybe you believe the Easter Bunny is the greatest Easter myth. Who really believes the folklore of an actual rabbit bringing colored Easter eggs and candy to children who have been good? He’s just a springtime Santa Clause. I wouldn’t argue the Easter Bunny actually exists. If he did though, I would not put his existence on par with the existence of Jesus. If you don’t believe in the Easter Bunny it doesn’t matter. However, rejecting a resurrected and alive Jesus is another issue entirely. Of all the world’s religions, only Christianity can claim a risen from the dead, alive prophet. That alone should catch your attention and cause you to investigate his teachings further. I should note that after his resurrection Jesus went on to be physically seen and touched by the women who went to the tomb, all of his disciples on multiple occasions, by over 500 other individuals from the area and lastly by the missionary Paul. They didn’t see a vision. Jesus wasn’t a ghost. He was real to them…wholly alive. That’s pretty serious evidence that debunks the stolen body Easter myth. And for his followers it’s what makes Easter special. Questions: Have you ever heard the myth that Jesus’ body was simply stolen? If it is true, how would the disciples have gotten past the elite Roman guard? Wouldn’t Jesus’ body have resurfaced at some point? 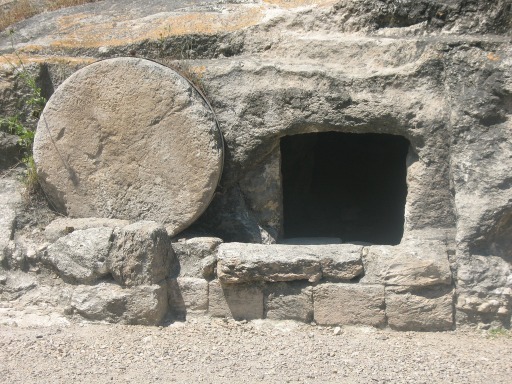 Do you think it matters Jesus rose from the grave? What’s another Easter myth you have heard of? Prior Post: Keep Your Emergency Savings Fund Under Your Mattress? Brian, this still proves that God uses money to test each of us. “…a clear bias that the whole of Christianity is true…” I’m glad you noticed that ezra. So you are saying Christians saw a pagan holiday and said “Ooh, let’s make our own story around that?” I think you missed the point in the post. It’s not about who owns the holiday…it’s about the event. Laurie recently posted…Why Do You Care? Absolutely! Have a great Easter! “…the devil has been trying to cover GOD up since the beginning…” You are 100% right Joseph…it is his agenda to blind people from the truth. I have no doubt he was at work in the situation I described. If Jesus body was on this earth I believe we would have found it by now. Its not a mystery….he’s not dead. I agree Petrish. In fact, with the proper search effort, it would have been found in Jerusalem quickly. There wouldn’t haven been many places to hide it.